The winter solstice, the darkest and longest night of the year, is a time of reflection. Why not take a moment to offer up a pagan prayer for Yule? 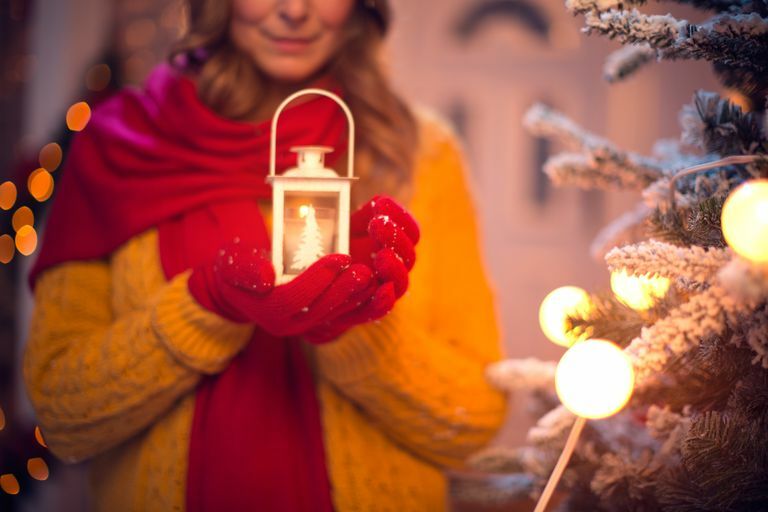 Try a different devotional each day, for the 12 days of the Yule Sabbat, to give you food for thought during the holiday season—or simply incorporate the ones that resonate with you into your seasonal rituals. Just because the earth is cold doesn't mean there's nothing going on down there in the soil. Think about what lies dormant in your own life right now, and consider what may bloom a few months from now. of the sun, and with it, life. When the sun first rises on Yule, on or around December 21 (or June 21 if you're below the equator), it's time to recognize that the days will gradually begin to lengthen. If you're hosting a winter solstice gathering, try to time things so your family and friends can greet the sun with this prayer as it first appears over the horizon. "The sun returns! The light returns! blessing us all with its rays." Despite the fact that some people hate cold weather, it does have its advantages. After all, a good cold day gives us an opportunity to cuddle up indoors with the people we love most. If your magical tradition honors a seasonal goddess, offer up this prayer during Yule. in the comfort of our homes and hearths." Although Yule should be a time of joy and happiness, for many people it is stressful. Take a moment to be thankful for your blessings and remember those less fortunate. "I am grateful for that which I have. "First, I am thankful for my health. Fourth, I am thankful for the abundance in my life." Continue counting off your blessings until you have thought of all of the things that enrich your life and the lives of those around you. In early winter, the skies become darker and the smell of fresh snow fills the air. Take a few minutes to think about the fact that even if the skies are cold and dark, it's only temporary, because the sun will return to us after the winter solstice. bringing with it light and warmth." The night before the winter solstice is the longest night of the year. In the morning, with the return of the sun, the days will begin to grow longer. As much as we enjoy the light, though, there is a lot to be said for acknowledging the darkness. Welcome it with a prayer as the sun sets in the sky. as the light of the stars shines down." In Scandinavian legends, when Frau Holle shakes out her mattress, snow falls to the earth. Yule is a time to set aside animosity between yourself and people who would normally antagonize you. The Norse had a tradition that enemies who met under a bough of mistletoe were obligated to lay down their arms. Set aside your differences and think about that as you recite this prayer inspired by Norse legend and history. a blessing at this season of Yule! We bear no one ill will. in the name of the season." Snow is symbolic of purity and inspiration. Depending on where you live, you may be seeing snowfall long before Yule arrives. Take a moment to appreciate its beauty and its magic, both as it falls and once it covers the ground. beneath a blanket of white." In many Pagan traditions, both contemporary and ancient, the old gods are honored at the time of the winter solstice. Take a moment to pay them tribute, and call upon them during the Yule season. Hail to Frigga, Minerva Sulis and Cailleach Bheur! may they grant us their blessings this winter day." The Celtic people knew the importance of the solstice. It was important to put aside staple foods for the coming months because it would be long before anything fresh grew again. Consider, as you recite this devotional inspired by Celtic myth and folklore, what your family has put aside—both material goods and things on the spiritual plane. In the middle of winter, it's hard to remember sometimes that though the days are dark and cloudy, the sun will soon return. Keep this in mind during those dreary days by invoking the four classical elements. Many ancient cultures and religions honored solar deities during the winter solstice. Whether you honor Ra, Mithras, Helios, or some other sun god, now is a good time to welcome them back. Bring life back to earth.